This article lists Best Free Makeup Photo Editor Software For Windows. These are face makeup software which let you apply virtual makeup to your photos. Using these virtual makeup software, you can enhance your photos by applying foundation, concealer, blush, lipliner, lipstick, mascara, eyeliner, etc. to images. You can also apply basic photo retouching like soften skin, remove blemishes, remove dark circles, remove shines, and more. You get various color shades for different cosmetics to apply to your photos. In some of these makeup photo editor, you need to use the brush to apply makeup, while many of them use trace lines to apply virtual makeup. These trace lines are added automatically by detecting facial features, or you can manually adjust trace lines. These makeup photo editor software support commonly used image formats for input and output, such as BMP, JPG, PNG, TIF, GIF, etc. You can also print resulting photos in some of these. Makeover is my favorite makeup photo editor for Windows. It is a makeup app for Windows 10 which provides sufficient as well as advanced features to apply virtual makeup to your images. The best part of this makeup software is that it provides real products to use for the virtual makeover. You can have a brief information on these products including product brand, quantity, and price. You may also like some best free Photo Enhancement Software, Photo Filter Software, and Batch Photo Editor Software for Windows. Makeover is a free makeup app for Windows 10. You can upload a picture from your computer or Facebook, or you can even click one using Camera and then apply makeup to it. As soon as you upload an image (BMP, PNG, JPG, JPEG), it lets you align dots for the facial features detection (face, left eye, right eye, lip). You can adjust the facial features using dots anytime. Now, you can fine-tune brightness, contrast, and color of the picture prior to applying virtual makeup. You also get the basic zoom in/out option to apply makeup accurately. Makeover provides real products to use for giving a virtual makeover to your photo. You can filter these products based on brand, color, and price. The details of each product are also available for you to check. These details include the product name, brand, quantity, and price. You can adjust the intensity of the applied makeup accordingly. There is a Remove option too to undo an action. You can easily switch between before and after pics. Face: Here, you get a wide range of original makeup products for Foundation, Concealer, and Blush, which you can apply to the face. Eyes: Here, you get tools to apply Eye Shadow and Eyeliner to your photos. For eyeshadow, you can select whether you want one color or two colors of shades. Lips: You get different shades of lipstick to apply to photos. It provies a wide range of color shades for each of the above mentioned tool. After applying desired makeup, you can save your photos on your PC (PNG, JPEG, TIFF, BMP, GIF) or share them via Facebook, Twitter, Pinterest, or Email. Makeover is a great makeup app for PC. It is extremely user-friendly and provides quite accurate and desirable makeover pictures. 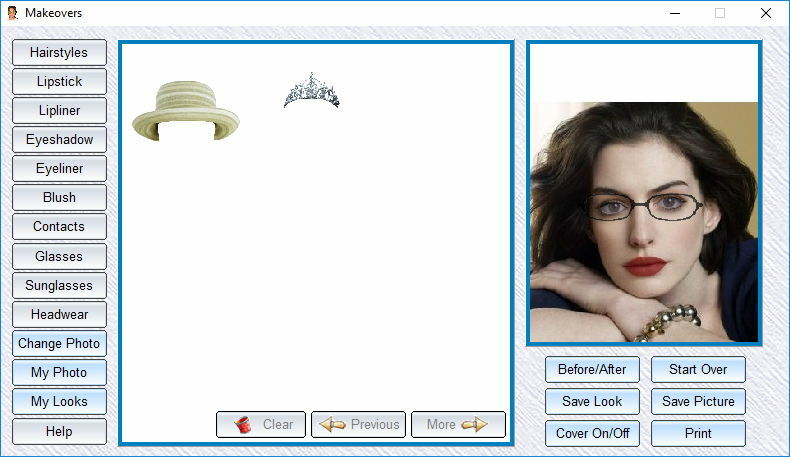 jKiwi is a free makeup photo editor software for PC. It supports only JPEG and PNG images to apply makeup to. As you open an image, it lets you choose an appropriate template for face shape. For more fine adjustments, you can use rotation and size tools. After doing this, you will see a separate window containing makeup editing tools. Concealer: You can choose a desired shade of concealer. It provides quite a few concealer shades to apply to the face. You can choose the brush size (area) and opacity of the shade used as per your choice. Shadow: To apply virtual eyeshadow, choose a desired color and draw left and right eye patterns for accurate results. You can adjust these patterns later too. It provides only one color eyeshadows. You can adjust area for application of eyeshadow and the opacity to0. Blush: Apply blush in the desired shade while adjusting application area and opacity of the blush color. Lips: To apply a desired shade of lipstick, you need to draw around lip area. Lens: Draw around left and right eyes and select a lens in the desired color to change eye color. Hair: Try different types of hairstyles on your photo. While doing so, it lets you select gender, hair type (short/medium/long), color (blonde, black, brown, copper, red, blue, etc. ), and highlight color. Free Draw: This is a tool to freely draw in the photo using a brush while choosing a desired color, opacity, and brush size. The applied makeup is viewed in real-time. You can have a preview of before and after images to compare the two. It lets you undo/redo an action whenever you want. In this makeup photo editor, you can save the edited image in PNG format. You can even print the original picture, edited photo, or before and after images. I really liked jKiwi as it provides quite accurate makeover results. It is quite easy to use and has a very simplistic user interface. Beauty Makeovers is another nice makeup photo editor for Windows. From its interface, you can access various makeup editing tools including hairstyles, lipstick, lipliner, eyeshadow, eyeliner, blush, contacts (blue, brown), glasses, sunglasses, and headwear. It provides a few pictures to use for trying its editing tools. To open your own photos, it supports formats including GIF, BMP, and JPG. As you load a photo, it lets you adjust the shape of the face and draw traces lines to apply eyeshadow and eyeliner. It provides limited color shades for all makeup tools. The amount of applied makeup can be set to light, medium, or heavy. To change hairstyle, you get different styles (glamorous, man, long, medium, short) and colors (blonde, black, brown, red, etc.). It provides only one hair type for each style. You can also add glasses, sunglasses, and hearwears to your photos. You can revert back changes at any time. Also, it lets you save a particular look with a custom name, which can be used in future. It lets you compare before and after pictures in a preview window. If you are satisfied with the makeover results, save the picture in JPG format or you can even print the picture. Beauty Makeovers is a simple software for makeup. It has very limited colors to use for applying face makeup. But still, I was happy with the makeover results. If you want to apply basic makeup to your photos, it is a good choice. Perfect365 is a feature-rich makeup photo editor for Windows. It supports JPG, PNG, BMP, and TIFF images to modify. You can apply makeup to a photo individually, or in a “Before and After” mode to compare original and edited photo in real-time. Skin: Here, you can remove blemishes, remove dark circles, soften skin, remove shine, etc. You can also apply foundation and blush in any of the provided shades while varying the intensity of the color. Face: Here, you will find tools which let you lift cheeks, slim down your face, and enhance your nose. Eyes: Apply eyeliner, colored contacts, eye color, eyelashes, eyeshadow, brighten eyes, enlarge eyes, and shape eyebrows. Mouth: Deepen smile, customize lipstick, apply lip tattoos, and whiten teeth are the tools you get here. After applying changes, you can save makeover pictures in any of JPG, PNG, BMP, and TIFF formats. Also, it lets you take a print of an edited image or share it on social platforms like Twitter, Facebook, etc. You can also add a picture to favorites section to quickly access it. Unfortunately, in the free version of this face makeup software, you get a watermark on edited pictures. To remove the watermark, you need to buy its pro version. Beauty Guide is another one of free makeup photo editor software for Windows. It is a user-friendly face makeup software for PC users. It provides proper demonstrations of individual tools before you start using them. It supports images in JPEG, TIFF, BMP, and PNG formats. As you open a photo in any of the supported formats, you will be able to view various tools in right section of the interface. These tools include Lipstick, Eye Color, Bleach Teeth, Smart Patch, etc. You also get tools like Smudge (to blend imperfections), Undo Brush (to undo an action for a particular area using brush), Resize, Crop, Rotation, Text, Adjustment (brightness, contrast, gamma, saturation), and Emphasis (to emphasise a particular area). You can also zoom in/out the photo to make accurate adjustments. For each tool, you get to choose brush size, color, and brightness level. You can rotate and flip an image. Beauty Guide is a very basic and simple virtual makeup software. After applying makeup, you can save the image in JPEG, TIFF, PNG, and BMP formats. MakeUp Instrument is another makeup photo editor for Windows. The free (demo) version of this makeup software comes with feature limitations. To utilize all of its features, you need to buy its full version. This makeup software lets you browse an image from your PC to apply makeup. It supports a wide range of image formats including JPEG, PNG, BMP, GIF, RAS, TIFF, JNG, ICO, and many more. The tools it provides for applying makeup are: Liquify, Skin Cleaner, Eyeshadow, Eyeliner, Glamour Skin, Lipstick, Toot Brush (teeth whitening), and Blusher. To apply makeup, you need to use the provided brush. You can adjust the brush size, hardness level, amount of makeup, hue, saturation, lightness, color, etc. using tools available in the left pane. To apply a particular makeup, you get modes to select to work in. For example, for Liquify, you get different Deform Modes including Move, Push Left, Grow, Shrink, Stretch, Squeeze, and Remove. Unfortunately, in this free makeup software, you can’t save the result as an image. Although, you can take a screenshot of the makeover photo. This makeup software for PC is another nice software to use to apply makeup. You can try different kinds of virtual makeup on your photos to have an idea of how it will look in real. DigiMakeup is yet another free makeup photo editor software. It provides a set of editing tools at the right panel of its interface. After loading an image (JPEG, PNG, ICO, PNG, TGA, TIF, PBM, etc. ), you can apply virtual makeup to it using a brush. The size of the brush is adjustable as it suits you. The makeup tools you get in this makeover software are Makeup, Rouge, Powder, Eyeshadow, Eyeliner, Lipstick, Lip liner, and Lipgloss. All of these aforementioned cosmetics are available in different shades. You can undo/redo changes if needed. 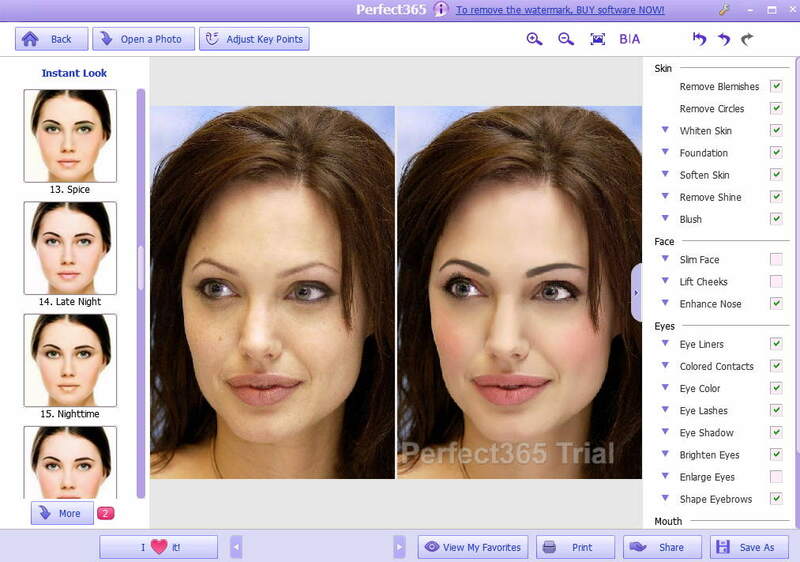 DigiMakeup is a very simple makeup software. After applying virtual makeup, the edited image can be saved in JPEG, PNG, ICO, PNG, TGA, TIF, PBM, etc. formats.